عندما تزور نادي, ستشعر أنك في بيتك في Sheraton Fiji Resort الذي يقدم لك إقامة متميزة و خدمات عظيمة. يحظى هذا الفندق ذو 5 نجمات بمكان ممتاز يسمح بالوصول إلى المعالم السياحية الأكبر في المدينة، فهو يبعد مسافة 7. Km عن صخب المدينة. كما يمكن الوصول بسهولة إلى Port Denarau, كابتن كوك, جالاكسي 2. يقدم Sheraton Fiji Resort خدمات لا غبار عليها وكل أشكال اللياقة وحسن الضيافة اللازمة لإسعاد ضيوفه. لضمان راحة ضيوفه، يقدم الفندق الخدمات التالية: خدمة الغرف على مدار الساعة, مرافق مخصصة لذوي الاحتياجات الخاصة, واي فاي في المناطق العامة, صف السيارات, خدمة الغرف . في Sheraton Fiji Resort غرف نوم يزيد عددها عن 297 صممت بذوق وعناية لتوفر لك كل وسائل الراحة . بعضها يحتوي أضاً على تلفزيون بشاشة مسطحة, اتصال لاسلكي بالإنترنت, مكيف هواء, مكتب, شرفة/ تراس. إن مركز للياقة البدنية, مسار جولف - ضمن 3 كم, حمام سباحة خارجي, سبا, تدليك هو المكان الأمثل في الفندق للاسترخاء وتفريغ طاقتك بعد نهار طويل. 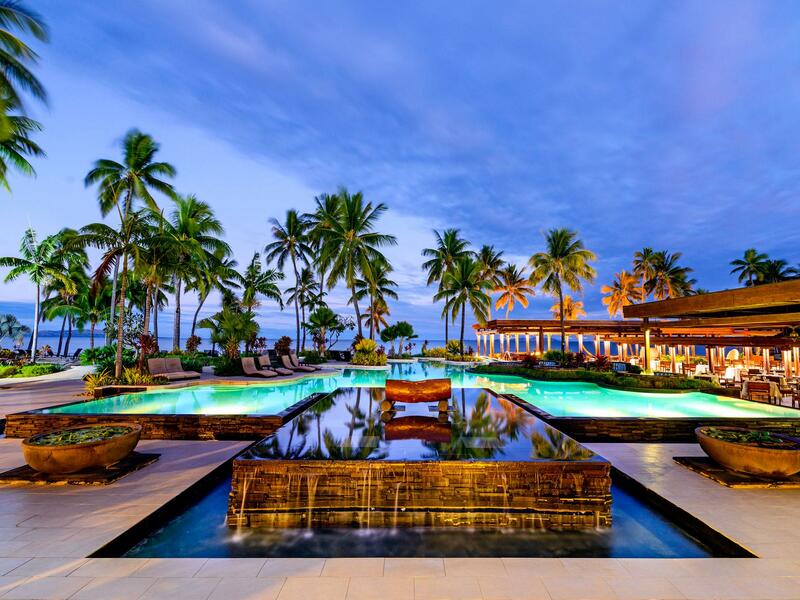 اكتشف مزيجاً ساحراً من الخدمة الاحترافية والخيارات الواسعة من وسائل الراحة والمتعة في Sheraton Fiji Resort. اعتبارًا من 6 يناير 2014، سيُطبق رسم إداري على جميع المعاملات التي تتم بالبطاقة الائتمانية بنسبة قدرها 3%. سيُحتسب هذا الرسم على المبلغ الإجمالي للمعاملة ويُسدد أثناء إجراءات تسجيل الخروج. لا تنطبق أي نقاط SPG (ضيف ستاروود المفضل) على الغرف المحجوزة على هذا الموقع، ولا يتم احتساب الإقامة كنقاط للوصول إلى فئة النخبة. We had a lovely stay at the Sheraton and hte facilities are clean and nice. The resort is very family friendly and there are a lot of young children. Even though they have an adults only pool area you will find kids swimming and playing around there. If you are looking for a relaxed couples holiday I would not recommend you this resort. Lovely staff, Food was good and fairly priced for Fiji standards. One of the best places to stay on Denarau. The staff were fabulous and the food was delicious, although expensive (but that is common on Denarau). The only draw back was the small room, but you really don't spend much time in there. Pros: -comfortable room -allows you to use the facilities of sheraton villas and the westin. We went pool hopping of the 3 properties. The westin pool is the nicest and more quiet. -this is recommended if you are travelling as a family. But if you are a couple or you want peace and quiet its better to stay in Westin -food is good, great breakfast buffet spread. But for lunch or dinner or drinks. I recommend that you go instead to Port Denarau. You can also go there for brunch. If you are alone it's cheaper if you take the Buka Bus at FJD $8 for daily hop on hop off. If 2-4 pax its cheaper to take a cab at FJD $7-8 per way. -free daily activities -half or full day trips to nearby island -lots of activities for children Cons: -Too many people. Too crowded. Not recommended if you want peace and quiet. Though they have adult pool if you want some peace and quiet but the pool looks old and small. The resort itself is pretty good. Can access to the facility of Sheraton and Westin. Due to peak season, the pools all filled with people so didn't really make you want to swim. The breakfast was the highlight, huge variety and really good quality of food. I have tried the flying fish restaurant, the food was good but the service was a huge let down. Waited for 2 hours to get the food while the restaurant was half empty. The buffet dinner definitely worth trying, not cheap, but you won't be disappointed. The hotel room itself was nice, with large bathroom, would be perfect if there's a bath. Overall a pleasant experience. We stayed here and our children and our grandchildren stayed inthe Villas.The rooms were clean and roomy.The patio looks very tired.Very accessible to everything.The staff could not do enough for you.They are what make us come back. The resort is amazing and do family friendly. Great place to stay and relax. Extremely nice and clean rooms especially ocean front . Hotel porters very friendly . Overall a great and relaxing atmosphere. Buffet breakfast was excellent , however, restaurants are very expensive . I'm really impressed overall and recommend other travels to give it a chance and have a ball at this great property. After spending less money on better resorts on the islands we were quite surprised with how run down and dated this hotel was. Pool was poorly looked after and facilities were certainly not up to the standard you’d expect for a Sheraton. Pricing for food and drinks ridiculously expensive and not warranted in anyway as the meal we had was ordinary and beers not cold. It's not the place for a quiet relax as the constant noise and smell of the jet ski's going around and around the course straight in front of the resort is annoying at best. Good value meals at the golf club or port. Pro's close to airport and port for island hopping. Place didn't even have a gym. We booked this hotel excited to stay at Sheraton. The hall and entrance was lovely however when we entered the room the furniture was old. The room smelled old too and we did not like that. When we asked for another room they gave us a better room. The new room was still lacklustre and did not live up to Sheraton's name. The hotel has a beach front but the water is murky and not appealing. The swimming pools are suitable for young kids not adults. The prices in the hotel are overpriced. One beer costs $10-12 AUD. If you are looking for a holiday in Fiji with clean water I wouldnt recommend this hotel. I would recommend other hotels in the same area Radisson, West Inn and the Hilton. The staff at the Sheraton are very friendly and nice. No complaints with the customer service. The problems are with the facilities and hotel rooms. I heard it is much better to stay in the South coast because the water is much nicer. Staff are way to over the top with saying Bula, it sounds fake after the 100th time that day! Otherwise staff very friendly. Resort prices way to expensive for food and drinks. However the flying fish is an exception, the quality of the food is amazing! Wouldn't change a thing about the flying fish, easily best restaurant in Fiji! We are couple in our 60's. We were told we had been upgraded to an oceanview room but next to crèche where organised noisy activities were in full swing. We then transferred to a room further away but due to bleach smell couldn't move in for a further 3 hours. As a Starwood member for 14 years & holding a Starwood,Privilege Pacific card, we have stayed at many beautiful Sheraton & Westin hotels & are aware of their excellent reputation around the world. After further misadventures, too numerous to mention in this summary, the Westin Rooms Manager generously offered a credit on the Agoda booking & we transferred over. This is my 3rd stay at Denarau & my 24th visit to Fiji. After using the facilities of the Sheraton, Sheraton Villas & Westin this visit, I can advise the Sheraton is a 5 star crèche & only suitable for young families. It was a lovely quiet restful stay at the Sheraton. The staff were very helpful and the service was quick and efficient. We did not have access to e-mail while at the Sheraton so a daily notice of activities could of been helpful. A hotel of this quality should have sky television also. The price of food and drink was far too expensive especially when there was 20% tax on top of the bill. Otherwise a very nice hotel.